What’s It About? Radcliffe stars as single and depressed medical school drop-out Wallace, who meets Zoe Kazan’s Chantry at a party and they hit it off. He walks her home but their night ends there as she goes inside to her boyfriend. They become good friends, but can they remain friends and nothing more? The Verdict: Michael Dowse directs a plot that is hardly breaking any new ground, so this is a movie that will live or die based on the performances, the script, and whether there is anything new amongst the fairly familiar set-up. Posters for the film proudly call it ‘the best rom-com since (500) Days of Summer’ – this was a film that had its own style and felt fresh with its time-jumping quirkiness and great soundtrack. What If would really like to be as good as (500) Days, but it won’t come off well in that comparison. Where (500) Days had a big dance number (complete with an animated bird), this has a few moments with Chantry’s animations coming to life, but they feel tacked-on to a film that otherwise plays it very straight, purely in an attempt to tick the box of ‘quirky’. 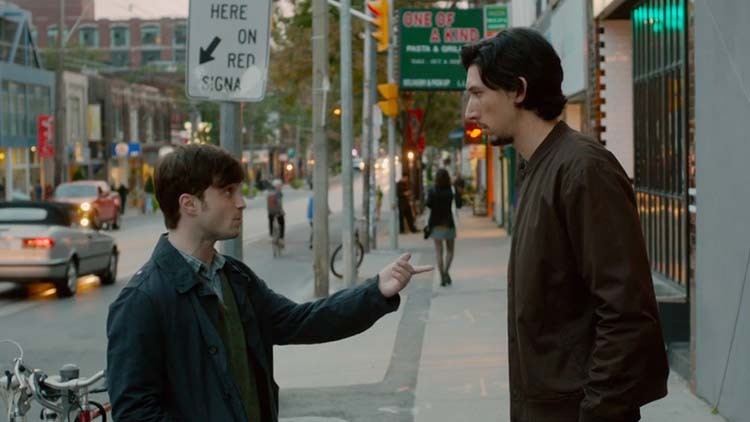 As for the performances, Daniel Radcliffe is pretty good as Wallace – he plays slightly socially awkward, depressed, living-in-his-sister’s-loft well. His English accent means his voice stands out a bit to begin with, but that’s soon forgotten as the film gets going. He brings charm, humour and warmth to his grounded character. Zoe Kazan, best known for starring in (and writing) Ruby Sparks – again, a movie that does have a lot more edge and originality than this – is probably not straying far from her comfort zone, but she is sweet and thoroughly likeable despite the ‘potentially cheating’ situation. The supporting cast around them are also good, though bordering on caricatures at times. 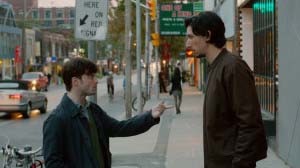 Adam Driver (Girls, and soon to be Star Wars Episode 7), as Wallace’s best friend Allan, provides many of the film’s best lines, and his developing relationship with Nicole (Mackenzie Davis) is fun to watch. Chantry’s sister Dalia (Megan Park) also has her moments. It is a very chatty and dialogue-heavy script that may take a little while to get in tune with, but once you get used to it, it flows quite well. There are a couple of slapstick moments, but most of the comedy comes from the script – the funny lines Wallace, Allan and Dalia say. For a rom-com, though, it isn’t all that funny. To really work, this is a film that would have to offer something a bit different, yet it does succumb to cliché on occasion – someone trying to stop someone else getting on a plane? Check. Skinny dipping? Check. It also suffers from a few cheesy moments, particularly later on in proceedings, and the odd clunky bit of dialogue. There isn’t really anything to set it apart from many other rom-coms. Whilst What If probably won’t blow anyone away, by the end it has done enough to make you care about the characters and their lives, so it does achieve success on that front, where many films do fail. Final Words: Radcliffe puts in a decent performance in a film that just about passes, largely thanks to its supporting cast and flowing script. It’s nothing all that original and doesn’t have the edge or humour of the films it has been compared to, but it’s a solid film that provides the occasional laugh and some touching moments. What If is released on 20 August 2014.